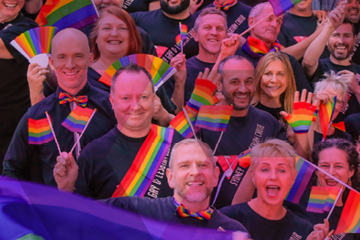 Have you been thinking about joining the Sydney Gay & Lesbian Choir but just couldn’t decide when the time is right? Well our Open Day is just right for you. In a relaxed atmosphere you’ll have the chance to meet members, be a part of rehearsing and learning new repertoire, find out our plans for 2019 and enjoy some drinks and nibbles. Remember SGLC is an UN-AUDITIONED choir and we welcome everyone from the LGBTQI spectrum as well as our straight allies, basically anyone who is accepting, friendly and wants to be a part of our community. The Open Day will be at Glebe Town Hall (location below) and starts at 2pm, we’d recommend arriving a little before that, we’ll have time at the end of the afternoon for some relaxed socialising and chatting over drinks and nibbles before we finish up at 4pm. If you’ve got any questions don’t hesitate to contact us, we’re always happy to answer them.